Halo Tactics is a fan made set of rules to play battles set in the halo universe. This is a complete set of rules that can be use with any miniature, you may use the Halo ActionClix miniatures made by Wizkids, halo Magablogs models or even your own creations to play this rules. The Covenant Empire, also referred to as the Covenant, was a theocratic hegemony made up of multiple alien species that maintain control over a large portion of the Orion Arm in the Milky Way galaxy. The Covenant waged a genocidal campaign against humanity, declaring that humans are n affront to their gods. The Covenant was a political, military, and religious affiliation, originally a mutual alliance between the San 'Shyuum and Sangheili following a brutal conflict between the two warring races. Its expansion to include at least six other races united in the worship of the Forerunners and the Halo Array soon began after the original formation. The highest caste, the San 'Shyuum, or "Prophets," as Humans call them, lead the Covenant and exert complete control over all religious and political affairs. Though physically weak, Prophets wield power through absolute command of the Covenant and through scavenged Forerunner technology, leaving the task of conquest to the Elites and the other races. 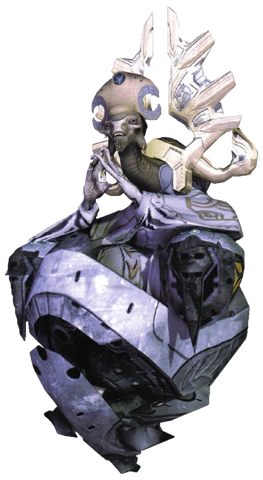 Their higher understanding of the Forerunners gives them great ego and religious influence over the Covenant. The High Prophets are addressed as "Hierarchs", "Noble Hierarchs", "Holy Ones", or "Exalted" by the other races of the Covenant. In your Squat: In halo Tactics exist in this moment 1 character from the San 'Shyuum species, and that is the Prophet of regret. This is a good buster for you team and can be used smartly to nerf some UNSC heroes or characters. His cannon is good for destroying powerfull characters but is weak in close combat, so is good to protect him with some Elite honor guards or Brute honor guards. The second highest caste; Sangheili, or Elites as Humans call them, served as the military leaders of the Covenant before the Great Schism in 2552. While Prophets often had the final say, it was the Elites who organized military campaigns and naval engagements. They maintain the military structure of the Covenant and ensured the Prophets' orders are followed, as well as their own. Sangheili consider the other client races to be below them in all ways. 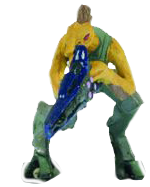 The Sangheili are the only known race permitted to build and operate starships within the Covenant, though the crews are almost always composed of a mix of races. Sangheili are separated into ranks based on skill and experience. To advance in rank, Sangheili must honorably earn such advancements on the battlefield. They were a major component of the Covenant and were the only caste able to maintain the military hierarchy as well as having a voice within the High Council before the Great Schism. 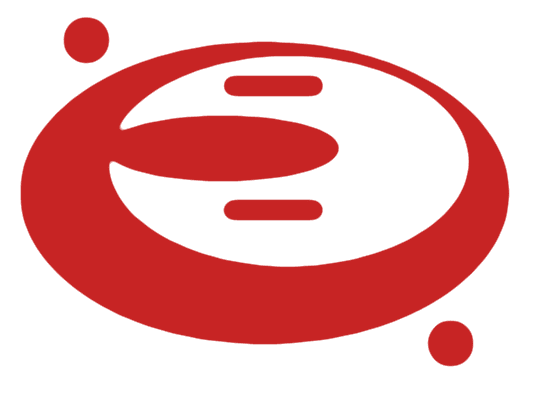 An "ee" at the end of an Elite name, such as "'Zamamee or 'Vadumee", signifies that that Elite is a part or was part of the Covenant military, although, after the Great Schism most, if not all, Elites removed the "ee" from their names to show that they had left the Covenant. Special Abilities: Covenant Empire Team ability. Ambidexterity. Concentrated Fire: When Elite makes an attack, if the attack roll is doubles and hits, after the attack resolves he may immediately make an attack against the same target as a free action. Shields (Def 1): Damage dealt to this character is reduced by 1. In your Squat: Elite are one of the best options for your squats, they can improve the combat effectiveness of your grunts and jackals (with the use of the Covenant team ability) and be very effective in stopping Spartans. Elite has two common shapes (Elite mayor and Minor) and access to good weapons (Plasma rifles, Covenant carbine and energy sword). A good Elite character is the Arbiter, he can hunt down important characters in the enemy squat and give support to your team. 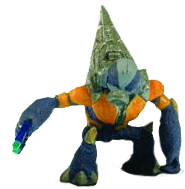 Jiralhanae, known to Humans as Brutes, They are one of the newer species to the Covenant and are the only race that has obtained very close to equal status to that of one of the founding "clients" of the Covenant pact, the Sangheili. They have an incredible natural resilience to damage due to their tough hides, which easily make up for their lack of energy shields, and use a number of weapons and vehicles based upon their pre-Covenant technology. This technology, though primitive compared to other Covenant weapons, is nonetheless extremely lethal, with most Brute-developed weapons having blades attached to them. In addition to their standard form of combat, Brutes will sometimes go "berserk" and try to kill anyone or anything in their path. This shows the aggressive nature of the Brute, and the little tolerance they have when they are cornered. Brutes have their own ranks going up to War Chieftains who usually wield plasma cannons, fuel rod guns, or Chieftains who usually wield gravity hammers. The Jiralhanae always work in packs of 3-8 when possible. They took over the role as personal bodyguards of the Prophets and also now make up most of the Covenant military. Special Abilities: Covenant Empire Team ability. Inhuman Strength, Ambidexterity. Fury: Give this character a close combat action. After the close combat attack resolves, it may make a second close combat attack as a free action. In your Squat: Brutes are powerful melee fighters, if they reach a target they can destroyed easy with their attacks, but they have low defence. Brutes also have access to nasty range weapons, like the brute shot and even plasma cannons (thanks to their Inhuman Strength), and to the mighty gravity hammer. Mgalekgolo, or Hunters as they are known by Humans, are thought to be giant monsters, but they are actually an assemblage of worm-like entities called "Lekgolo" that creates a communal, armor plated form. In this form, they are known as "Mgalekgolo". They always fight and travel in pairs known as "Bond Brothers" which technically means that not all of the colonies of worms were able to fit within one set of armor, and are the strongest of the Covenant fighting units. 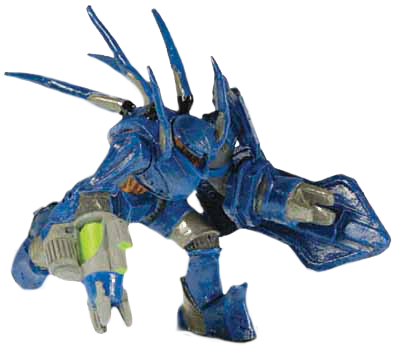 They wield powerful assault cannons and a massive shield resistant to any small arms fire which may also be used as a melee weapon due to its sharp sides and the Hunters' great strength. They are usually used as weapons platforms, and are only deployed on the battlefield when in need of a heavy force - they are used more like heavy duty equipment than soldiers. Their political and religious motivations are completely unknown. Special Abilities: Covenant Empire Team ability. Weapon Lock (Fuel Rod Cannon). Combat Shield: Modify this character’s defense value by +3 against ranged combat attacks. Smash: A character hit by a close combat attack from this character takes +1d3 additional damage. Massive: This character cannot be push back. In your Squat: Hunters can decimate the battlefield with some shots of theur fuel rod cannon. This are the living artillery of any Covenant squat and they are hard to kill. The nemesis of any hunter are the Spartans. 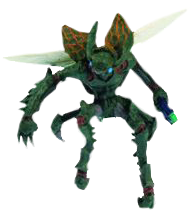 These flying insect-like creatures, also known as Drones or Buggers by Humans, served almost exclusively as engineers, but were then replaced by the Huragok. This created a hatred towards the new, peaceful engineers by the Yanme'e that sometimes resulted in violence. Afterwards, the Yanme'e were used as aerial combatants against the UNSC, who were inexperienced at fighting airborne infantry. 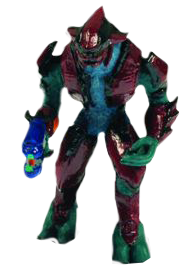 In combat, their weapons of choice were the Needler, which creates a super-combine explosion if enough projectiles are fired into the same target, and the Plasma Pistol. Their ability to fight on the wing, and their usual deployment in large groups, made them an excellent strategic weapon against ground-based opponents. Special Abilities: Covenant Empire Team ability. Infiltration. Jump infantry. In your Squat: Drones are the perfect scouts and infiltrators, they can go to capture victory areas behind enemy lines and try to outflank the enemy. Fragile but elective. Due to their superior senses, the Kig-Yar, or Jackals/Skirmishers as they are known by Humans, are the scouts and marksmen of the Covenant military, they are the second lowest Covenant caste and are about 5'6" tall. Due to their lack of physical durability, they carry a portable energy shield generator during combat. Jackals are employed mainly as sharpshooters with their excellent vision and dexterity, and are also deployed to defend strategic areas. When a Jackal is under fire, it will cover its head with its hands and trot away to another position from which to fire. The first Human contact with the Covenant was between Staff Sergeants Johnson and Byrne on a Human freighter as Jackal pirates tried to board the ship. They have very strong dislike of the Unggoy because they are always trying to assert their superiority over them in the caste system of the Covenant. Once they poisoned a recreational narcotic that the Unggoy use which nearly caused them to become infertile. This caused the Grunt Rebellion. Take Cover: If this character has cover, his Defence improves in +2 instead of +1. In your Squat: Good support characters, Jackals are integral part of any covenant squat. With access to sniper weapons and shields that allow them to advance the battlefield this are excellent skirmishers. 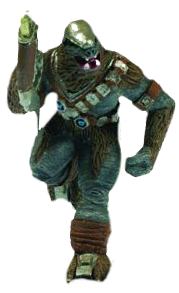 Hailing from Balaho, Unggoy, known as Grunts among Humans, are the most common and lowest-placed caste of the Covenant. The Unggoy were barely into their own Iron Age when the San'Shyuum discovered them. Classified as a "Tier 6" civilization by the Forerunner charts, the Unggoy were at a primitive point in their cultural development, the Unggoy had little choice but to accept entry into the Covenant hegemony, or otherwise risk extinction. After their incorporation into the Covenant their entire history was erased and they essentially became a slave race. Despite their notable cowardice and ineptitude, they are quite dangerous in large numbers, which was why an Arbiter was needed to quell the Grunt Rebellion. They breathe methane and thus must wear a large tank on their back full of the methane to survive on other planets. Relations between the Unggoy and the Kig-Yar are strained in the best of times. Stand Together: Modify Grunt's attack value by +1 when he is adjacent to at least one other friendly character named Grunt. Quickfire: When Grunt misses with a ranged combat attack, roll a d6 after actions resolve. On a result of 6 he may make a ranged combat attack as a free action. In your Squat: Grunts are the must cheap character in the Covenant faction, and they are good (for their price). Grunts are good in large numbers, able to capture objective or go as meat shields to rain fire to the enemy, is common to see this little guys in a Covenant Squat. Updated rules: Hail to the hammer!